Renowned worldwide for its high-quality French timepieces, Cartier proves once again it knows how to craft genius with its men's Tank Francaise watch. The sophisticated timepiece is designed with a rectangular stainless steel case, a stationary stainless steel bezel, and a flexible stainless steel link bracelet with a secure deployment buckle clasp. A scratch-resistant sapphire window protects the square white-guilloche dial face, which features black Roman numeral hour indexes and matching black minute indexes. Dark sword-shaped steel hands and the Cartier logo beneath the 12 o'clock position complete the elegant look. This watch is powered by Cartier's own Calibre 120 Swiss-automatic movement and is water resistant to 99 feet. Product DetailsShipping Weight: 1.8 pounds (View shipping rates and policies) Shipping: This item is also available for shipping to select countries outside the U.S. Stainless steel case with a stainless steel link bracelet. Fixed stainless steel bezel. Silver opaline dial with blued steel hands and black Roman numeral hour hour markers. Minute markers on an inner ring. Battery operated Swiss quartz movement. Scratch resistant anti-reflective sapphire crystal. Fluted crown set with synthetic cabochon. Solid case back. Case diameter: 28 mm. Case thickness: 9.5 mm. Deployment clasp. Water resistant at 30 meters / 100 feet. Functions: hours, minutes. 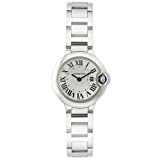 Cartier Ballon Bleu de Cartier Ladies Watch W69010Z4. Stainless steel case with a stainless steel bracelet. Fixed stainless steel bezel. White grained dial dial with blue steel hands and black Roman numeral hour markers. Minute markers around an inner ring. Date displays at the 3 o'clock position. Quartz movement. Scratch resistant sapphire crystal. Stainless steel case back. Case dimensions: 31 mm x 25 mm. Case thickness: 6 mm. Hidden deployment clasp. Water resistant at 30 meters / 100 feet. Functions: hours, minutes. Cartier Tank Francaise Steel Midsize Watch W51011Q3. A modern interpretation of Cartier's signature Tank design, the Tank Francaise is a stylish blend of strength and beauty. This smaller version features a thin curved steel case on an elegant brushed steel bracelet with polished borders and a hidden deployment clasp. Visible beneath the sapphire crystal, the off-white dial boasts bold black Roman numerals, blue steel sword hands, and the Cartier name. An octagonal crown, appointed with a blue spinel cabochon, adds a distinctive touch. A sophisticated accent for any occasion, this watch offers Cartier calibre 057 quartz movement and is rated water resistant to 30 meters.